Powder Coating - Allied Plating Supplies, Inc.
High performance finishes with outstanding weatherability, ranging from thin film clears to very smooth high gloss colors. GMA (glycidyl methacrylate acrylic) acrylics provide the best protection for exterior applications. GMA acrylics can also be used as a topcoat for enhanced performance. Ideal for applications requiring ultimate corrosion resistance, excellent chemical and mechanical properties, exceptional adhesion, and the ability to meet demanding specifications. Our epoxies can be custom-tailored to suit specific applications such as long-term dielectric strength at high temperatures. Available in TGIC and TGIC-free formulations. They are tough, attractive, and demonstrated outstanding physical properties and overbake resistance. They can withstand prolonged outdoor exposure and are often the coating of choice for lawn and garden furniture as well as other types of outdoor equipment. Polyester clear coats can be applied over a basecoat to enhance exterior performance. 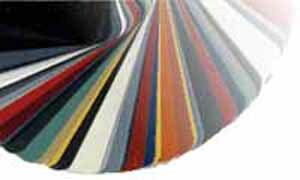 A blending of epoxy and polyester resins and are used primarily for indoor applications. PPG powder hybrids offer better penetration into corners and recesses (Faraday Cage Areas) and are less sensitive to overbake on curing than many other chemistries. Outstanding thin-film appearance and toughness with excellent weatherability. They are competitive with high quality liquid paints and demonstrate superior chip, mar, and scuff resistance at thicknesses as low as 1.5 mils. Their adhesion to properly prepared ferrous and non-ferrous substrates is excellent, giving them long-term resistance to humidity and salt spray. Depending upon the base resins and crosslinkers employed, they can be formulated to provide tremendous variations in chemical and physical properties to suit individual applications. PPG supplies the highest quality fusion bonded epoxy (FBE) powder coatings available.